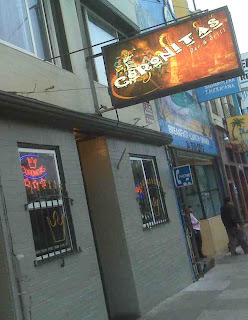 The Sprinkler did not make an appearance this week as Coronitas professes itself more a sports bar than a dance club. I thought the next stop would be Oye! Managua but that turned out to be a restaurant. As far as restaurants go it looked entertaining. 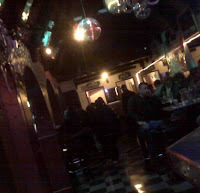 I poked my head in and saw a couple dancing, some people eating and the music was bouncing. The look and feel was more of a campaign gathering than a night out so I decided to make my way down the block to the corner of Virginia Avenue and Mission Street. I continued along Mission to Emmy’s Spaghetti Shack at 3355 Mission Street. Emmy’s is an excellent place to grab a good cheap dinner with a fun and funky atmosphere and shares its bathroom with a bar. Alas the bar doesn’t open until 6 and was still padlocked shut when I showed, so eager to get my journey started I decided to move on to the next location, Coronitas Bar and Grill, about a half block away. Entering Coronitas I was surprised to see a security guard at the door unlatching the chain to let me in. I wasn’t asked for an ID, not that anyone thinks I’m younger than my 34 years, or to pay a cover charge I was welcomed in. I guess in a sweater and jeans I don’t look that threatening, it could be the J-Crew and Quicksilver labels. Who knows? The place was hopping. A good crowd for 6 on Friday night, all male customers of course, but the liveliest group I’ve seen so far. As I made my way to the bar the interior reminded me of a Chevy’s Restaurant with TexMex décor, neon signs and beer logo pendants hanging from the ceiling. The only thing missing was the tortilla making machine in the middle of the checkered linoleum floor right next to the juke box. A group of guys were playing pool in a room separated by New Mexico fashioned brick archways. 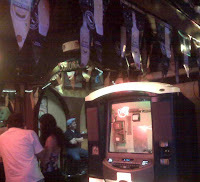 Tall bar tables line the walls from the back of the bar/restaurant to the entrance. The juke box sits in the middle of the room playing; you guessed it, Spanish tunes. On the TVs were Sports Center and the Tour de France. Nobody was watching because they’re too busy conversing amongst themselves and trying to get one of the 6 waitresses in very short miniskirts to come by their tables to have a drink. The waitresses weren’t shy in downing a shot with the boys but hanging around meant that a flab grab was on the way. What is a flab grab? It’s when someone puts their arm around you as if to give you a hug and grabs your love handles (also known as a spare tire) copping a feel. There was a lot of flab grabbing going on. I’m hoping the girls were getting decent tips on top of the free drink. 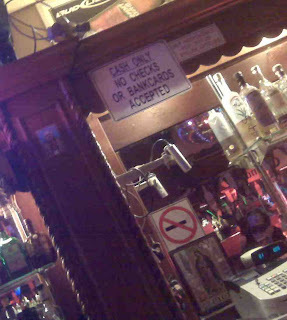 But I wonder what Pope Benedict XVI, whose picture hangs above the Virgin Mary behind the bar (the pope is barely visible middle left of the picture to the right and Mary bottom right), thinks about all this. And why is the pope hanging from the wall? Carla, a nice enough bartender, continually fed me drinks as I waited and spoke with Garina, the waitress. At 7 it was time to find the Giants game. I had to help Paker, the second bouncer who only has 2 front teeth, find the baseball game because it wasn’t on its usual channel. I called a buddy who hooked us up and we were off and running. Too bad Parker a local boy, who’s dental duet of two front teeth were so easterly and westerly pointing one has to wonder if he only eats out of the side of his mouth, was a Cowboys, Lakers and Braves fan. Standing up for Bay Area teams is hard to do considering our teams have sucked the last couple of years. My only hope is that the San Jose Sabercats win the Arena Football Championship next week versus the Philadelphia Soul. What a sad state of affairs when you’re rooting for the local Arena Football team.